"I Wouldn't Normally Do This Kind of Thing"
"Yesterday, When I Was Mad"
Very is the fifth studio album by English synth-pop duo Pet Shop Boys. It was released on 27 September 1993 by Parlophone, nearly three years after the duo's previous studio album, Behaviour, and following the compilation album Discography: The Complete Singles Collection. Very exhibits one of many turning points the Pet Shop Boys would make to their music, shifting from the subdued electronic pop of Behaviour to richly instrumented dance arrangements. The content and lyrics led to Very being called their "coming-out" album, since it was during this time that Neil Tennant had publicly discussed his long-rumoured homosexuality. After the Performance Tour of 1991, Pet Shop Boys elected to take a break, releasing their compilation Discography: The Complete Singles Collection that November. With that compilation many fans[who?] thought the duo were splitting since they released no new music in 1992. However, in 1993, Pet Shop Boys came back together and reinvented their image. This therefore, by many critics, is considered their "upper" album, as many viewed Behaviour as a "downer album". A limited edition of Very was also released as a double album titled Very Relentless. The second disc, Relentless, is a six-track dance album containing tracks that are more experimental and instrumental. There were plans to expand upon Relentless in 1994 by releasing the six tracks along with others, making a full dance album, but this evolved into Disco 2. The six tracks on Relentless have not been released elsewhere since (though "Forever in Love" is found on Very/Further Listening 1992–1994 in a remixed edited form as track 2). The album was reissued in 1996 as a mid-price release, this time in a standard jewel case with a new sleeve showing an image of the original case. Very was re-released on 3 July 2001 (as were most of the group's studio albums up to that point) titled Very/Further Listening 1992–1994. The re-released version was digitally remastered and came with a second disc featuring B-sides and previously unreleased material. The unreleased songs were recorded during the Very recording sessions, but Tennant and Lowe decided not to include them on the album originally. On 9 February 2009, the album was re-released yet again, still remastered, under the title Very: Remastered, but this time containing only the 12 original tracks. Following the 2009 re-release, the 2001 two-disc remastered version was deleted and remains out-of-print to date. It can only be purchased second-hand or MP3 digital download. Some of the B-sides are also on Alternative, their 1995 album of B-sides. 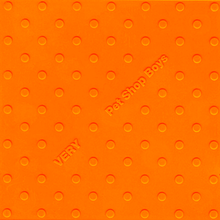 The original release of Very was packaged in a unique orange jewel case with raised bumps (sometimes unofficially described as the Lego case), designed by Daniel Weil of Pentagram in London. Very Relentless was similarly unique, with the two CDs housed in card sleeves (Very in orange and Relentless in pink) with both of these housed in a translucent rubber case with raised bumps. In June 2000, Q magazine placed Very at number 91 on its list of The 100 Greatest British Albums Ever. The album was also included in the book 1001 Albums You Must Hear Before You Die. All songs written by Neil Tennant and Chris Lowe, except where noted. (**) Not the version featured on PopArt. ^ Choir on "Go West"
^ Erlewine, Stephen Thomas. "Very – Pet Shop Boys". AllMusic. Retrieved 24 September 2015. ^ Kot, Greg (18 November 1993). "Gay Worldview". Chicago Tribune. Retrieved 24 October 2015. ^ Sandow, Greg (8 October 1993). "Very". Entertainment Weekly. Retrieved 24 September 2015. ^ Hunt, Dennis (31 October 1993). "Pet Shop Boys, 'Very,' ERG". Los Angeles Times. Retrieved 17 October 2015. ^ "Pet Shop Boys: Very". NME. 25 September 1993. p. 36. ^ "Pet Shop Boys: Very". Q. No. 86. November 1993. p. 131. ^ Considine, J. D. (25 November 1993). "Pet Shop Boys: Very". Rolling Stone. Archived from the original on 1 March 2009. Retrieved 29 August 2007. ^ Hull, Tom (2004). "Pet Shop Boys". In Brackett, Nathan; Hoard, Christian (eds.). The New Rolling Stone Album Guide (4th ed.). Simon & Schuster. pp. 630–31. ISBN 0-7432-0169-8. ^ Maconie, Stuart (November 1993). "Spacemen 2". Select. No. 41. p. 87. ^ Christgau, Robert (19 October 1993). "Consumer Guide". The Village Voice. Retrieved 24 September 2015. ^ "Pet Shop Boys "Very" compact disc case - Daniel Weil - Pentagram Design, United Kingdom - 1993". joeclark.org. 9 April 2009. Retrieved 15 March 2016. ^ "The 100 Greatest British Albums Ever". Rocklist.net. Retrieved 27 September 2011. ^ Robert Dimery; Michael Lydon (23 March 2010). 1001 Albums You Must Hear Before You Die: Revised and Updated Edition. Universe. ISBN 978-0-7893-2074-2. ^ a b "Very". psb-discography.com. Archived from the original on 15 October 2007. Retrieved 1 October 2007. ^ "Australiancharts.com – Pet Shop Boys – Very". Hung Medien. Retrieved 26 September 2011. ^ "Austriancharts.at – Pet Shop Boys – Very" (in German). Hung Medien. Retrieved 26 September 2011. ^ "Hits of the World" (PDF). Billboard. Vol. 105 no. 48. 27 November 1993. p. 91. ISSN 0006-2510. Retrieved 9 June 2018 – via American Radio History. ^ "Top RPM Albums: Issue 2290". RPM. Library and Archives Canada. Retrieved 26 September 2011. ^ a b c "Top 10 Sales in Europe" (PDF). Music & Media. Vol. 10 no. 43. 23 October 1993. p. 24. OCLC 29800226. Retrieved 26 July 2018 – via American Radio History. ^ "Dutchcharts.nl – Pet Shop Boys – Very" (in Dutch). Hung Medien. Retrieved 26 September 2011. ^ a b "Hits of the World" (PDF). Billboard. Vol. 105 no. 45. 6 November 1993. p. 51. ISSN 0006-2510. Retrieved 9 June 2018 – via American Radio History. ^ Pennanen, Timo (2006). Sisältää hitin – levyt ja esittäjät Suomen musiikkilistoilla vuodesta 1972 (in Finnish) (1st ed.). Helsinki: Kustannusosakeyhtiö Otava. p. 233. ISBN 978-951-1-21053-5. ^ "Le Détail des Albums de chaque Artiste". InfoDisc (in French). Retrieved 9 June 2018. Select "PET SHOP BOYS" from the drop-down menu and click "OK". ^ "Offiziellecharts.de – Pet Shop Boys – Very" (in German). GfK Entertainment Charts. Retrieved 9 June 2018. ^ "Top 40 album DVD és válogatáslemez-lista – 1993. 44. hét" (in Hungarian). MAHASZ. Retrieved 9 June 2018. ^ "Top 10 Sales in Europe" (PDF). Music & Media. Vol. 10 no. 44. 30 October 1993. p. 18. OCLC 29800226. Retrieved 26 July 2018 – via American Radio History. ^ "ベリー/ペット・ショップ・ボーイズ" [Very / Pet Shop Boys]. Oricon (in Japanese). Archived from the original on 25 October 2012. Retrieved 26 September 2011. ^ "Charts.org.nz – Pet Shop Boys – Very". Hung Medien. Retrieved 26 September 2011. ^ "Norwegiancharts.com – Pet Shop Boys – Very". Hung Medien. Retrieved 26 September 2011. ^ "Top 10 Sales in Europe" (PDF). Music & Media. Vol. 10 no. 47. 20 November 1993. p. 20. OCLC 29800226. Retrieved 26 July 2018 – via American Radio History. ^ "Swedishcharts.com – Pet Shop Boys – Very". Hung Medien. Retrieved 26 September 2011. ^ "Swisscharts.com – Pet Shop Boys – Very". Hung Medien. Retrieved 26 September 2011. ^ "Official Albums Chart Top 100". Official Charts Company. Retrieved 9 June 2018. ^ "Pet Shop Boys Chart History (Billboard 200)". Billboard. Retrieved 9 June 2018. ^ "European Top 100 Albums" (PDF). Music & Media. Vol. 10 no. 43. 23 October 1993. p. 22. OCLC 29800226. Retrieved 26 July 2018 – via American Radio History. ^ "Swedishcharts.com – Pet Shop Boys – Very / Relentless". Hung Medien. Retrieved 26 July 2018. ^ "ARIA Charts – End Of Year Charts – Top 50 Albums 1993". Australian Recording Industry Association. Retrieved 27 September 2011. ^ "The RPM Top 100 Albums of 1993". RPM. Vol. 58 no. 23. 18 December 1993. ISSN 0315-5994. Retrieved 9 June 2018 – via Library and Archives Canada. ^ "1993 Year-End Sales Charts" (PDF). Music & Media. Vol. 10 no. 51/52. 18 December 1993. p. 15. OCLC 29800226. Retrieved 26 July 2018 – via American Radio History. ^ "Top 100 Album-Jahrescharts – 1993". Offizielle Deutsche Charts (in German). Retrieved 9 June 2018. ^ "Swiss Year-End Charts 1993". swisscharts.com. Retrieved 9 June 2018. ^ "Top 100 Albums 1993". Music Week. 15 January 1994. p. 25. ISSN 0265-1548. ^ "1994 in Review: Sales Charts" (PDF). Music & Media. Vol. 11 no. 52. 24 December 1999. p. 12. OCLC 29800226. Retrieved 26 July 2018 – via American Radio History. ^ "Top 100 Album-Jahrescharts – 1994". Offizielle Deutsche Charts (in German). Retrieved 9 June 2018. ^ "Swiss Year-End Charts 1994". swisscharts.com. Retrieved 9 June 2018. ^ "Austrian album certifications – Pet Shop Boys – Very" (in German). IFPI Austria. 10 January 1994. Retrieved 27 September 2011. Enter Pet Shop Boys in the field Interpret. Enter Very in the field Titel. Select album in the field Format. Click Suchen. ^ "Canadian album certifications – Pet Shop Boys – Very". Music Canada. 31 January 1994. Retrieved 9 June 2018. ^ "French album certifications – Pet Shop Boys – Very" (in French). Syndicat National de l'Édition Phonographique. 21 September 1994. Retrieved 9 June 2018. ^ "Gold-/Platin-Datenbank (Pet Shop Boys; 'Very')" (in German). Bundesverband Musikindustrie. Retrieved 9 June 2018. ^ "Japanese album certifications – Pet Shop Boys – Very" (in Japanese). Recording Industry Association of Japan. Retrieved 31 August 2018. ^ Salaverrie, Fernando (September 2005). Sólo éxitos: año a año, 1959–2002 (PDF) (in Spanish) (1st ed.). Madrid: Fundación Autor/SGAE. p. 935. ISBN 84-8048-639-2. Retrieved 9 June 2018. ^ "Guld- och Platinacertifikat − År 1987−1998" (PDF) (in Swedish). IFPI Sweden. 9 November 1993. Retrieved 27 September 2011. ^ "The Official Swiss Charts and Music Community: Awards (Pet Shop Boys; 'Very')". IFPI Switzerland. Hung Medien. Retrieved 9 June 2018. ^ "British album certifications – Pet Shop Boys – Very". British Phonographic Industry. 1 December 1993. Retrieved 9 June 2018. Select albums in the Format field. Select Platinum in the Certification field. Type Very in the "Search BPI Awards" field and then press Enter. ^ "American album certifications – Pet Shop Boys – Very". Recording Industry Association of America. 8 February 1995. Retrieved 9 June 2018. If necessary, click Advanced, then click Format, then select Album, then click SEARCH. 1993 interview with Daniel Weil, designer of the Very package. This page was last edited on 10 February 2019, at 14:05 (UTC).